Too young to join the PGA TOUR? Si Woo Kim accepted that decision and understood why back in 2013 when he was just 17. But too young to win THE PLAYERS Championship? Kim wasn’t so accepting of that suggestion. “I really felt my (game) was good. I just felt ready,” said Kim, who started the fourth round in fourth place, but just two off a lead shared by Kyle Stanley and J.B. Holmes, with Louis Ooosthuizen solo third. PGA TOUR winners, each of them, but no worries, Kim said. With cross-winds of 15-to-25 miles per hour battering THE PLAYERS Stadium Course for a fourth consecutive round, conditions were so demanding that missing greens was the norm. In that department, Kim was like so many others, as he hit only eight greens. But oh, the touch and calm demeanor he showed. Perfectly, that is, because Kim was 10-for-10 in getting it up-and-down to save par. The most important came at the par-5 11th after Oosthuizen had made eagle to push to 8 under. Had Kim bogeyed, his lead would have been one. Instead, after pitching his third shot into a bunker, Kim splashed to 5 feet, converted the putt, and went on to shoot 69 for 10-under 278 and win by three over Oosthuizen and Ian Poulter. “That was huge,” said Kim’s caddie, Mark Carens. Perhaps not as important, however, as the maturity Kim had shown back in 2013 when he accepted the PGA TOUR rule about needing to be 18 to accept membership. What ensued were two seasons on the Web.Com Tour, but Kim never complained. “The Web.com Tour experience actually really helped me to get more experience,” said Kim. 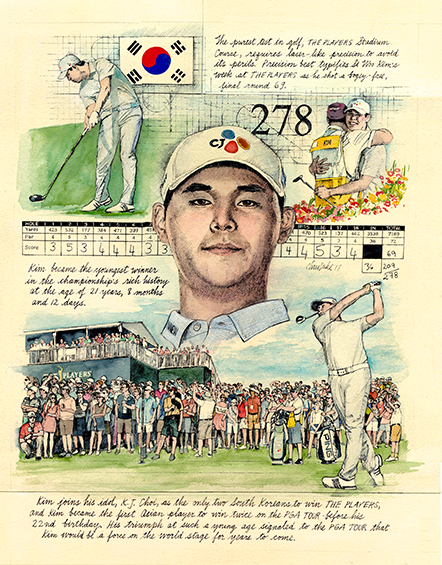 Remarkably, the experience provided the confidence Kim, 21, needed to become the youngest winner of THE PLAYERS and join Tiger Woods, Sergio Garcia and Jordan Spieth as the only players with two PGA TOUR wins before the age of 22.